We had a fantastic summer, most of which was spent hanging out with family in Burlington, Ontario. I love Burlington because of the family (and because, unlike England, there is sun and warm weatherin summer) but there is a strange fear of nature and the outside world - immaculately trimmed lawns, manicured parks and a drive and park culture suited to the town's road-dominated infrastructure. Park and shop and park and shop from aircon to aircon. If it's not too hot, it's too cold, there are bugs, smog, pollution, all kinds of things dedicated to keeping you indoors in a carefully managed, but even more toxic environment. And when you do get out to nature, it is all stage managed with walkways and barriers to protect you from the environment and the environment from you. Unless you head north proper but that is a horse of a very different colour. Lions and Tigers and Bears and all that - I'm not going there. 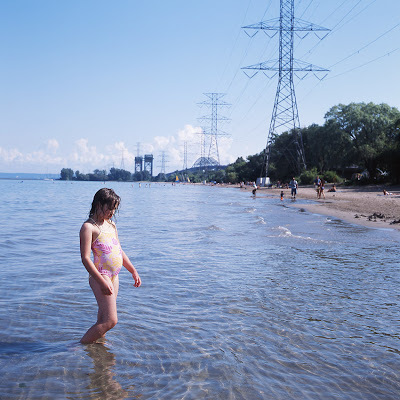 My favourite place was Burlington Beach because it was almost natural, and the unnatural part - the pylons and the Skyway - was such a perverse act of vandalism it made its industrial nature almost palatable. Everybody over the age of 40 used to swim in the lake when they were kids, when the lake was at its most polluted in the 60s and 70s, but the very thought fills everyone with horror now even though its cleaner than it has been for years, the odd E-Coli blowout excepted. Having seen the E-Coli readings, it was paradise compared to our normal swim-spots in the Bristol and English Channels or even the River Avon, waterways where the turds swarm together and lather you with brown flecked spumalicious foam. Lovely. No such trouble in tropical Lake Ontario where the water was clear, the fish were visible and the immigrant communities of Burlington and Hamilton gave the beach a holiday vibe. So keep on cleaning, shift the Hydro and who knows - maybe one day everybody will swim from Burlington Beach again. Did you know that if you walk under those power lines with a four foot fluorescent bulb it will light up. For real - that's so cool! I'll remember to pack a bulb with the towels next time we go. I don't know who decided to put those pylons there, but they deserve some kind of prize - perhaps we could think of something involving a four foot fluorescent bulb.